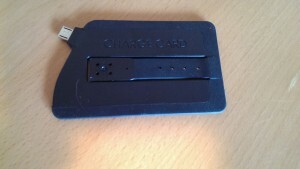 I have always said that I love Kickstarter projects and today I will be reviewing one called the ChargeCard. When you see the ChargeCard you may be thinking why would I need this and why do people think it’s so great? You can’t be blamed for thinking this as it ain’t exactly a life changing product but what I will say is that it is very useful. Being out and about a lot and having a lot of friends who love technology etc There have been many times I have been out and wished I had a USB cable to copy some music and files to or from my friends computer. Granted this doesn’t happen often but what about when your out and you need to charge your device? Now you don’t need your charger just a USB slot. 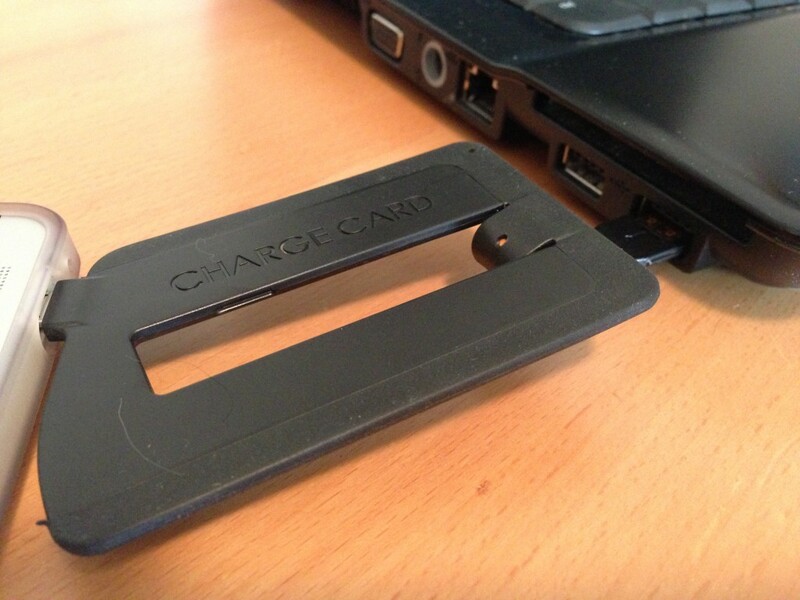 The ChargeCard can now be purchased direct from their website and it is available for Android, iPhone 4 and iPhone 5. The ChargeCard we are reviewing is for Android devices and measures in at 3.25 by 2 by 0.13 inches (HWD) so it is is a little smaller than a credit card but its about as thick as 3 but it fits in my wallet with no trouble at all. The ChargeCard isn’t the same shape as your average credit card either it has a diagonal cut out along one end with the micro USB connection to allow it to fit all devices as all Android devices differ. We went ahead and tested it on our HTC One, Galaxy S4, Nexus 7, Galaxy S2 and Nexus 4 and we didn’t have any trouble at all. The iPhone 5 version is the same kind of shape but the iPhone 4 is more credit card shaped. 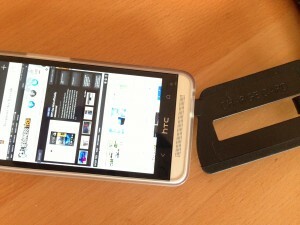 The middle of the card has a bit bendy rubber USB strip that easily clips in and out of place. The card itself uses USB 2.0 allowing you not only charge your device but as mentioned above you can transfer files to and from your device. The card itself feels and looks great the edge of the card has rubber along it giving the card a nice grippy feeling and this also keeps it in place while in your wallet. 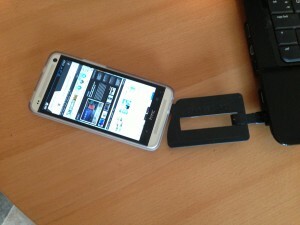 We also have tested the card on a few of our folio case’s that have card slots and the ChargeCard fits with no trouble. As I have had the card for a good while now it has allowed me to put it through several real life usage tests. The only problems I have run into is when using the card with a tower PC you are sometimes left with a hanging device as there is no where to rest the device. This is due to the size of the card and the fact there is very little extension. Obviously this isn’t a huge problem as most households have a laptop but I just wanted to highlight this. Overall the ChargeCard is an awesome product and very handy to have in your wallet. The total price for the card is $25 so not a huge expense as they deliver all over the world and will reimburse anyone who face import fees etc. If you have been debating getting one or even looking for a portable solution look now further. 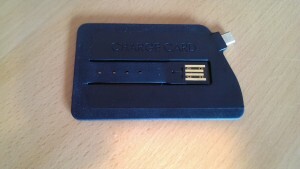 You can purchase the card from ChargeCardProject so go check them out.